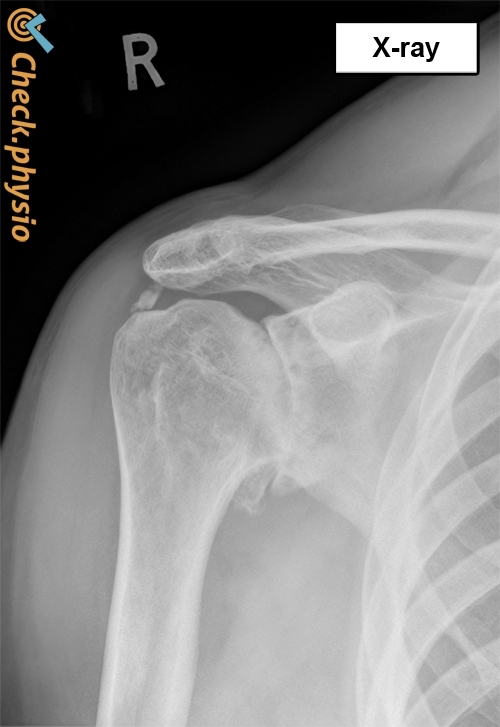 Osteoarthrosis of the shoulder is a less common form of arthrosis. It is commonly referred to as wear-and-tear of the shoulder. This refers to wear-and-tear of the cartilage. Osteoarthrosis of the shoulder mainly affects people over the age of fifty years. Joint surfaces made of bone are covered by a thin layer of cartilage. This is also the case for the ball and socket of the shoulder joint. The cartilage acts like a shock absorber and ensures optimum sliding of the individual bone components in the shoulder joint. 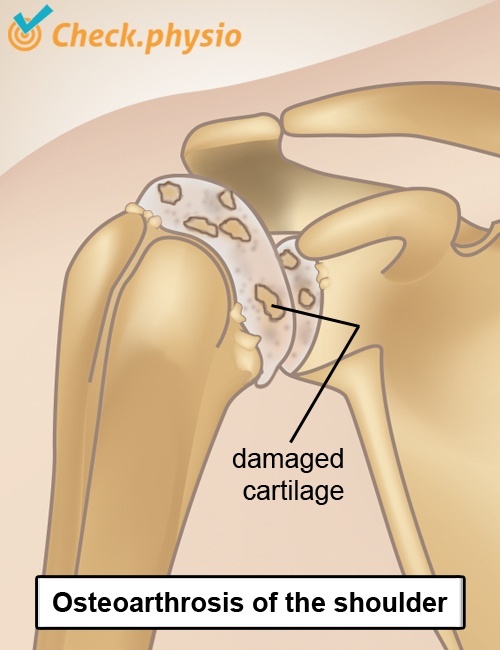 Osteoarthrosis of the shoulder is associated with a deterioration in quality of the cartilage. This causes the shoulder joint to move less smoothly and decreases the range of motion. Loss of cartilage can result in chronic shoulder symptoms. As the cartilage is gone, bone-to-bone contact can occur in the joint. This is painful and makes the joint less mobile. The body responds by forming osteophytes. This means that abnormal bony growths occur along the edges of the shoulder joint. This is the body's repair response to combat the effects of osteoarthritis. By making the joint wider, this distributes the pressure over a greater surface area. The patient is usually over the age of 50 years. The symptoms develop gradually as a result of ageing and wear-and-tear. The quality of the cartilage decreases with increasing age and wear-and-tear occurs. This is a natural process. Almost everyone over the age of 75 years has osteoarthrosis in one or more joints. Shoulder arthrosis can also occur at a younger age. For example, the cartilage can become damaged in an accident. Symptoms can also develop as a result of abnormalities within the joint. Prolonged injury of the tendons or the cartilage (for example after a fall) can result in osteoarthrosis, because the cartilage is used incorrectly for an extended period of time. Painful shoulder, particularly when starting to move. Crepitations (a cracking sound or sensation in the shoulder when moving). Decreased mobility of the shoulder movements. Not all of the symptoms are present all the time and people can experience periods with a lot of symptoms or few symptoms. It is often difficult to indicate where the pain is located. The X-ray will reveal joint space narrowing between the ball and socket of the shoulder. Any osteophyte formation will also be visible. X-rays are taken if the physical examination cannot rule out shoulder arthrosis based on the symptoms and the tests that were performed. Wear-and-tear of the cartilage cannot be reversed. Once it's gone, it's gone. It is possible to keep the cartilage as healthy as possible by getting regular doses of gentle exercise. We will provide an explanation below about why it is important to keep moving. An exercise programme for the shoulder, under the supervision of a physiotherapist, can be created to combat the effects of osteoarthrosis. In addition, various techniques can be applied to keep the shoulder as mobile and pain-free as possible. If conservative treatment does not result in improvement, then surgical intervention can be considered. A number of procedures are possible. A shoulder replacement (shoulder prosthesis) can be performed for severe, increasing symptoms. However, shoulder replacement performed for shoulder arthrosis does not provide the same results as knee or hip replacement. Therefore, the first objective is to try to reduce the pain using medication.